Homemade Spice Cake with Maple Frosting and Maple Glazed Pecans – the perfect Thanksgiving or Christmas dessert recipe! As easy as a box mix but tastes SO much better! The aroma alone of this cake is enough to put you in the holiday spirit. Cinnamon, ginger, cloves, nutmeg, and maple waft through the air as this cake bakes, and it makes a house smell like home during the holidays. What could be more comforting? 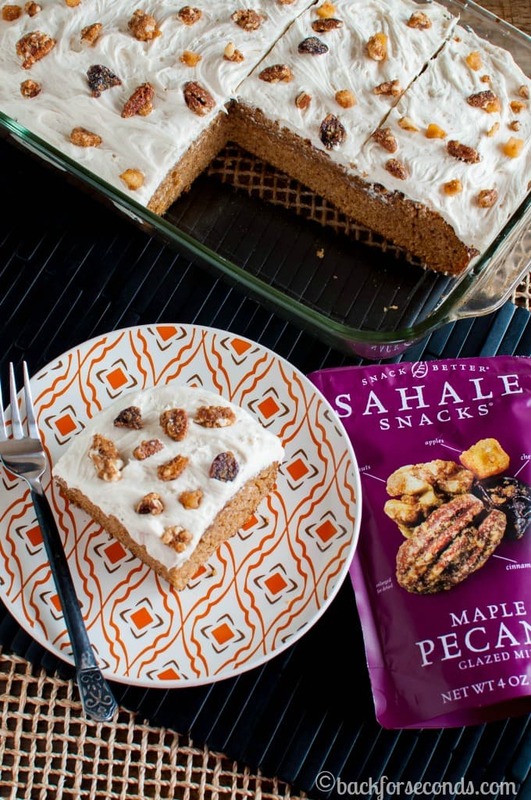 I had the pleasure of trying a variety of Sahale Snacks recently, and I am completely hooked on the Maple Pecans. Apples, cherries, walnuts, and pecans are glazed in a maple coating, and they are extremely difficult to resist. They also have Balsamic Almonds (my hubby loved these), and Pomegranate Pistaccios (also super tasty), and several other varieties. I love finding snacks like this because not only are they delicious, but they are non GMO, gluten free, and contain no artificial flavors, colors, or preservatives. You can feel good about eating these and feeding them to your kids! The Maple Pecans were hands down my favorite and the idea for this cake immediately popped into my head. 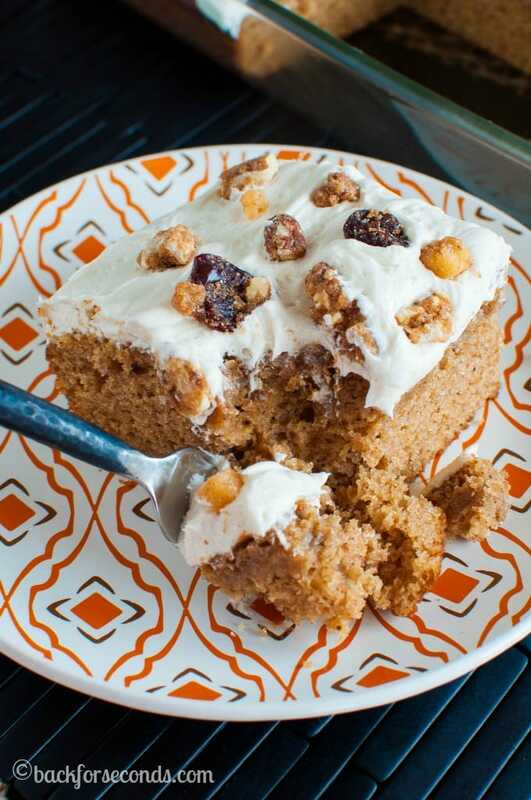 Light, fluffy spice cake with creamy maple frosting, topped with crunchy maple pecans. Mmmmm, seriously scrumptious! I am not a big pumpkin pie lover, so I am thinking this cake needs to happen for Thanksgiving! It has all the warm, cozy holiday spices, and it even looks festive! This would be a wonderful addition to any holiday table – or make it just because. Any time is a good time for cake! And don’t forget the Maple Pecans – the added crunch really makes this cake spectacular! 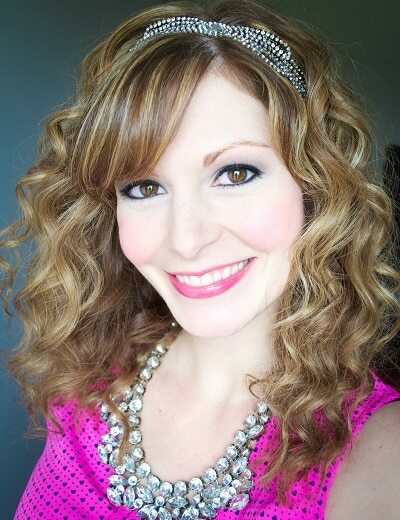 Thanks to the JM Smucker Company for partnering with me and allowing me to share my recipe featuring Sahale Snacks! As always, all opinions and thoughts are 100% my own. Loving those maple pecans on top! Delicious! This looks absolutely fabulous….I’d be in danger of polishing off the whole thing in one sitting. 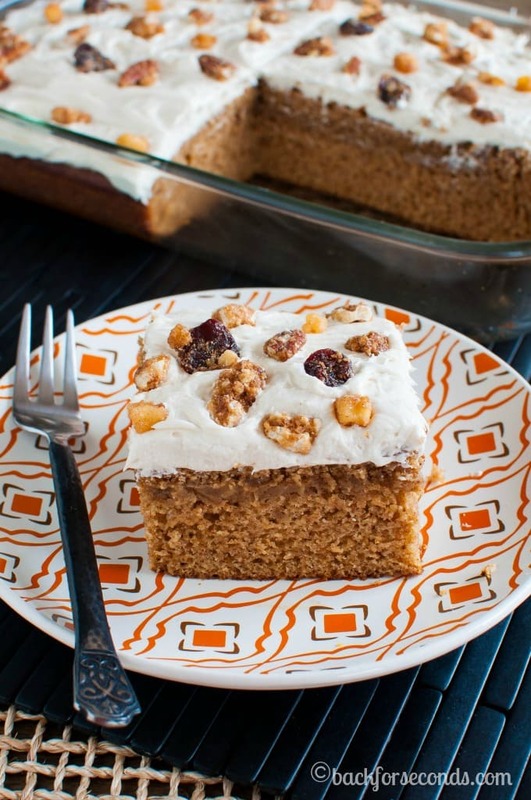 I love love love spice cake! These nuts look like they take it to a new level of yumminess! Maple and spice are often overlooked in all of the pumpkin spice madness of fall. This cake looks so warm and inviting! YUM! 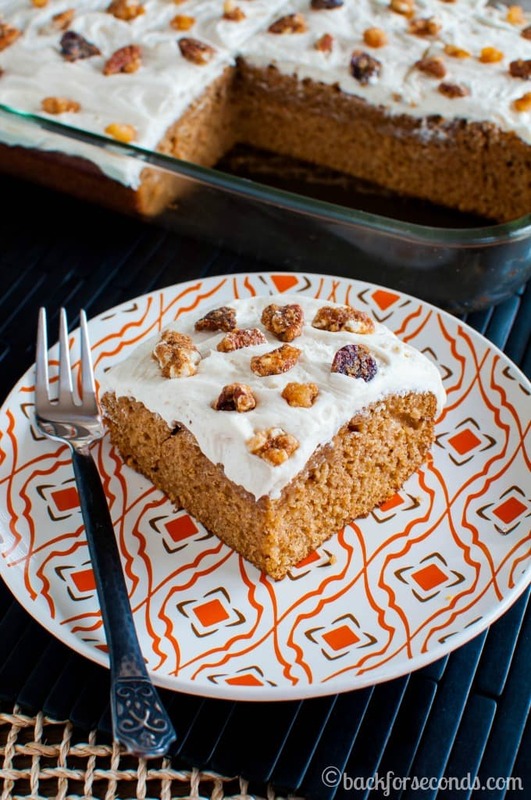 I love spice cake but actually never make it! Thanks for the delicious reminder & recipe!! Looks amazing! 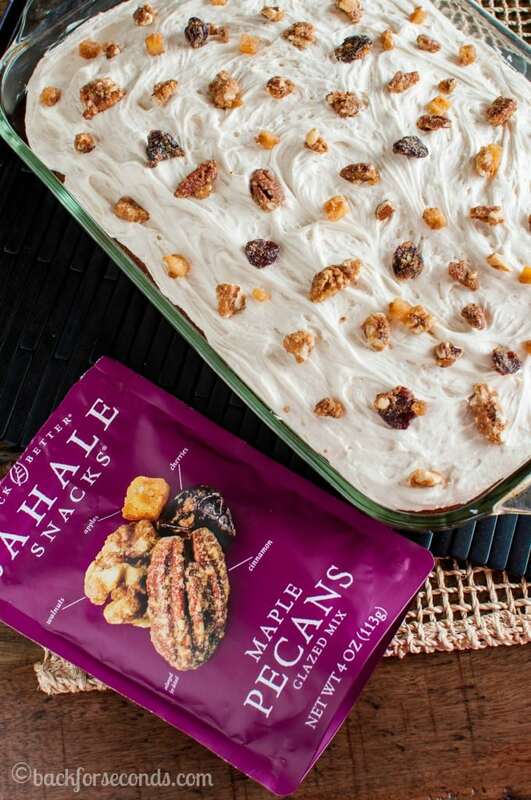 The maple pecans look like the perfect finishing touch. 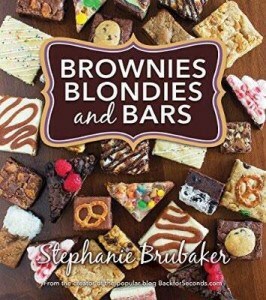 That looks sooooo good and I love Sahale snacks! That snack mix sounds so incredible! And so does this cake!